BROWSE FROM OUR SELECTION OF TEAM APPAREL. PRICE BREAKS FOR LARGE ORDERS. MADE IN THE USA. Welcome to 20 Degrees Below! We are a cut-and-sew house in beautiful downtown Philadelphia producing custom fleece jackets, custom swim parkas, and branded apparel for groups and teams. This means that everything you order is cut and sewn from scratch right here in the USA. You have the benefit of choosing from a ton of fashionable colors and combinations, as opposed to large catalog companies that don't have the customization capabilities we offer. Please allow 2-4 weeks for your blank orders to be ready. We can also provide decoration services, but we're happy to send out your order to any decorator you choose. Add 10 days for delivery time on custom decorated goods. Minimum number of ordered-goods is 6. Please call with any questions and we look forward to serving you! Brett and his team are awesome! Through my changes and additions and adjustments and even the artwork – simply wonderful! Thanks so much for everything to make our outing complete! Love our custom swim parkas. So far so good! Ordered fleece vest samples. They were done in a timely fashion. Fleece is great quality. Colors ae vibrant. Outstanding quality sewing. Great to deal with Brett the company president. Awesome to have items MADE IN THE USA! Can’t wait for my current large order to arrive so I can eimbroider them all! Brett made my ordering experience great, he was helpful with meeting our logo requirements, our price point, as well as offering suggestions, the turn around time was great as well. I will definitely use his services in the future. 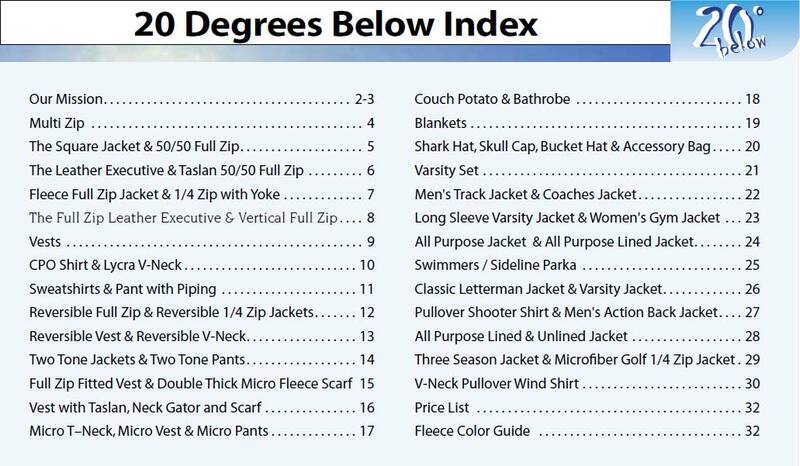 For over 20 years, 20 Degrees Below continues to be a price-leader in the wholesale team apparel industry. Everything, including our custom swim parkas, is manufactured right here in the USA.